with these Special Events and Projects! The 15-Year Anniversary Exhibition features 15 alumni from Root Division’s Studios Program, producing high caliber work in a variety of media. The exhibition is complemented by a full color catalogue including photos and information about all 183 of Root Division’s Studio Artist Alums. Designed in collaboration with Electric Works, this limited edition of 50 box sets features 15 prints by Root Division Alumni. Featuring 11x14 in. prints in photography, silkscreen, letterpress and digital prints inside a specialty archival box, this is a Root Division collector’s dream! Our anniversary celebration continues! This one night event will feature performances and interactive projects by 15 Root Division Studio Artist Alumni. 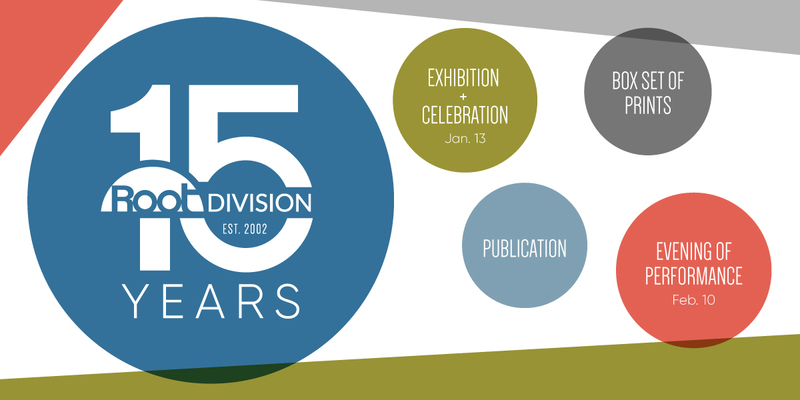 On view in the gallery will be our 15-Year Anniversary Exhibition featuring 15 Alumni Artists. Don’t miss this lively evening of performances and interactive projects!